A large knot of stocky build, tapering at rear. In winter plumage (when most likely to be seen in the region) told by long, decurved bill with heavy base, large greyish spots on underparts, faint supercilium (caused by more extensive greyish lores) and obvious tail pattern. White rump/ uppertail-coverts contrasting with dark upperparts and tail; upperparts dark caused by dark streaking to centres of grey feathers. 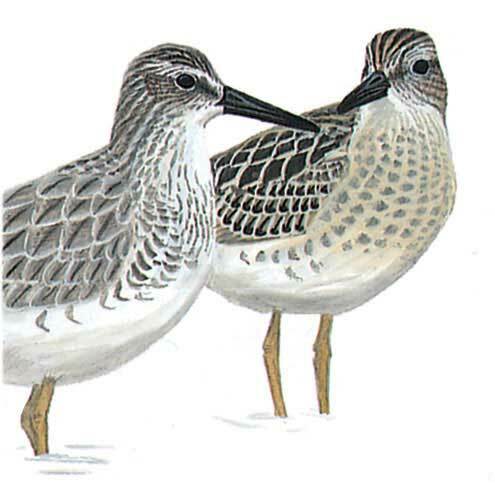 In breeding plumage easily told by dense blackish spotting on breast and flanks, dark streaks on mantle and hindneck and chestnut centres to scapulars. Juvenile told by heavily marked breast, contrasting with pale belly, and pale-fringed wing-coverts with dark shaft-streaks.